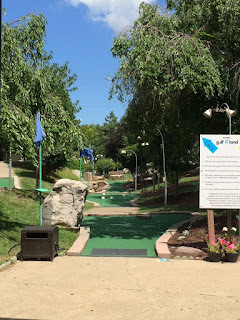 "" Writer's Wanderings: Miniature Golf - A Sweet Deal! The B.A. Sweetie candy warehouse has been around for a while but they are now in a new facility and have just recently opened Sweeties Golfland, a miniature golf course--actually two. One is easy and one is hard but the sweet deal is that the early bird special Monday through Friday from 10 AM - 3 PM is only $5/game (normally $7). We chose the easy course for the grands and set off on the first of eighteen holes. The day was perfect and there was no one playing behind or in front of us for most of them so the kids got to practice the next hole while Grandma and Grandpa took their shots. There were lots of trees to shade us and benches to sit on while we watched the others take their shots. Beautifully landscaped and well-cared for, it was a wonderful morning outing. 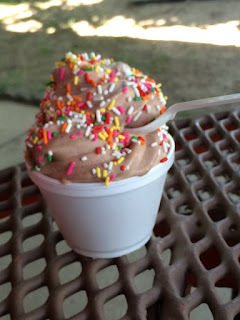 On the last hole our grandson got a hole in one so he got a spin on the prize wheel and won a free ice cream cone. He cashed in on it after we had our lunch of hot dogs and nachos. Of course we had to buy the other two ice cream as well but the prices were reasonable. The only mistake we made was taking them into the huge candy warehouse. There was no way to come out without some kind of sugar treat. Prices there kind of surprised me. They were more than I expected. Maybe the savings is in the quantity buying. A soda shop is in the works and we will definitely be back to check it out and play more golf--with or without grandkids.